We never went to day care before. All these kids were smelling my hiney. My Lily was terrified and shaking. They kept an eye on my Lily cause she was very scared. Hey mom see ya later. Well I am still in the middle of all those kids. Mom watched us on a video cam. See my Lily all the way in the back by the wall? There were all kinds of kids at day care. I had so much fun, but was sure happee to see mom. I was pooped on the way home. I didn't do anythingy NEARLY as fun as you did. Sorry that Lily didn't think much of it. Maybe the NEXT time she will love it though. Did you get to sniff some hiney Benny? I have never been to a place like that but it looks so skeery with all those dog sniffin...ya and all. Glad that Mom got abck and you are home safe and sound now!! Wow, you have doggie-day-care there?! That is fabulous! Must be a great place to expand one's social repertoire. awwwww.... Lily's little face and body language looks soooo sad, but I am sure it all turned out great! Looks like a very nice facility. Our Jeter and on occasion, the Diva Halle, go to Dog Tired Doggy Day Care in Anchorage and Jeter always falls asleep in the car on the way home! We've never been to day care, but I bet it's fun! I'm sorry you didn't have a good time, Lily! What an exciting trip!!! We don't have one of those, where we live. It REALLY looks like fun! We've never been to day care either, but you sure looked like you had fun. Too bad Lily didn't like it! We're with Miss Lily. We don't think we'd like it very much -- or maybe mom's just a big chicken! Anyway, we went for a nice hike with our furiend Miss Mabel Lou from Creekhiker blog. We had a guurrreat time!! Happy Monday, B & L!! Oh Lily I am so sorry you were so scared! Why did your Mommy take you to Day Care? Is she going on a trip??? Uh-oh, was I not supposed to say it!!?? Day care can be such a traumatic experience for some...but at least you know you'll be sniffed for ever and sleep for days! Benny. looks like you are much more the day care dog than your sister! So did Lil ever warm up? Maybe she will like it better after a couple of tries. Looks like you had a blast Benny! Never been to one. Dat bridge looked pretty fun. Wow what a great way to make some new doggy friends! Looked like a very nice daycare. I hope the doggies there have been very nice to you & Lily. You are exhausted. There sure was a lot happening at daycare. We've never been, in fact, we don't think there is one here. Oh, poor Lily. New places sure can be scary when you're a kid. Once she gets as old as me, she'll be fearless! OoH Benny I luvs to go to daycare too but it makes me sad dat Lily did not have fun at yours. :( I sure hopes dat it is better da next time fur her. Woo had to be in furry good paws and tail! Poor Little Lily. She looks so scared. Too bad you couldn't leave the other kids behind to comfort her. What a fun way to spend Sunday! We think we see a husky pup there - hope you had some fun with him/her too. Poor Lily - hope she was feeling more comfortable by the end of your visit. Sorry Lily did not enjoy it a lot! Maybe next time she will feel more comfy there! It's too bad Lily was so scared. Hope you had fun playing with the others though :) We went to Abuela's house to run around the back yard and then went to see our Cousins Grayce and Danger and play with them. We were pooped that night too! I don't like doggy day care, and I don't need socializing. So there. Hi Lily, I completely understand. 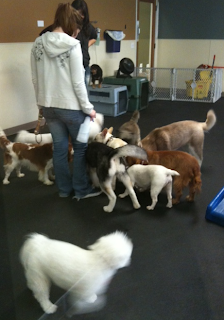 I get a little shaky around big groups of dogs and people (don't tell anyone, it will ruin my image). What a nice Sunday you had! Ours was pretty much quiet and relaxing, oh and me got a bowl of beef stew from Zackt and family! Yummy! Maybe you'll like it better next time, Lily? Benny sure did seem to have a great time! We felt so sad for Miss Lily!! Oh Lily...I am so sorry you were scared. I bet you will like it better next time! Benny is so funny falling asleep like that! Hey, do I see a Sibe or two in there? If I was one of them, I would have made sure Lily was OK. I don't like seeing anyone scared! I hope Lily learns to like daycare. It is OK to not want to play. My Beautiful Raja loved daycare but all she ever really did was sit around and watch the other dogs. Of course they all want to sniff your bottom when you first go in, but that gets old fast and then they wander off to play with their pals. Benny, you have to kind of visit with Lily sometimes, OK, to make sure she is not scared. I have never been to day care, but it looks like lots of fun to me! where can I get one of those booster seats?